Platelet Rich Plasma Therapy is a sophisticated non-surgical injection procedure, widely indicated for wound healing, of soft tissues and bones. The same is now included by H & S Hair Transplant Clinic of Harley Street for hair loss treatment from androgenic alopecia as well as other hair loss types, by healing inflamed stem cells and raising immunity in miniaturised hair. Blood plasma is a component of blood that functions as an extracellular matrix for blood cells, when concentrated from blood; it is a yellow liquid substance. Platelets are another component of blood that functions in clogging blood vessels and help stop bleeding and are a living body’s very own property for healing wounds through coagulation and many growth factors. Platelets found in the blood plasma are believed to have greater strength in repairing wounds than in circulating blood. Platelet rich blood plasma could be cultured and made into an injectable serum that has great healing properties and growth factors majorly the vascular endothelial growth factor (VEGF) and platelet derived growth factor (PDGF) and many bioactive proteins. This injection therapy is widely used in medicine for internal wound healing, bone marrow transplantation and many more ailments, including promote growth in miniaturising hair. The autologous procedure uses platelets extracted from the patient’s own blood plasma by first taking more or less of 100mls of blood from the patient’s vein and spinning it in a centrifuge added with platelet activators and collagen. The solid platelet rich plasma is isolated from the liquid blood, and made into a serum, that is filled in a syringe or spray that is injected under local anaesthetic or sprayed onto the scalp. 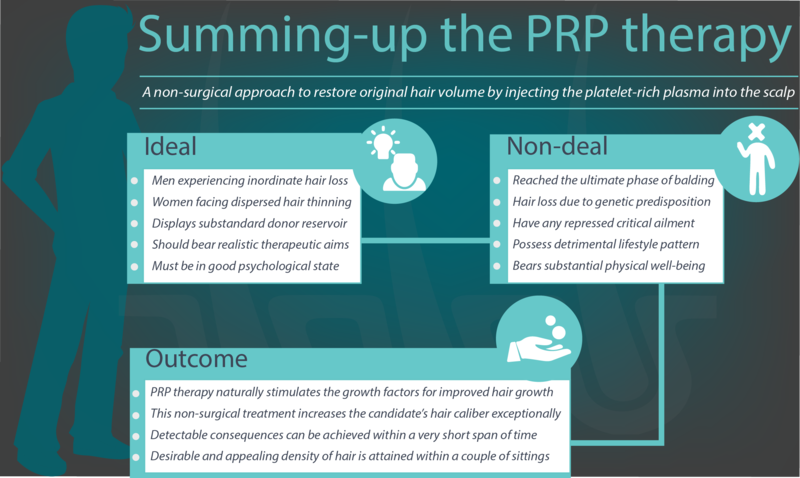 PRP for hair loss treatment is designed to be a course of 8-9 months initially between intervals of 4-6 weeks, and after 9 months then it could be once in a year for maintenance. Larger number of patients has noticed a reduction in their hair thinning with the 2nd or 3rd month of the treatment. PRP is also well used in conjunction with a hair transplantation, to stimulate the newly relocated hair grafts from shock loss. It repairs any trauma or dryness in the hair grafts, promoting hair growth against telogen effluvium, which is a significant complication associated with hair restoration surgery. PRP hair loss treatment is ideal for diffuse and patterned hair thinning and it works by stimulating still existent miniaturizing hair, but not grows the hair back on a bald scalp, much like hair loss medications. For coverage of bald scalp, hair transplantation is still the only valid option for hair restoration. It is not ideal for patients who any medical history of viral infection or scarring alopecia due to infections, or those who take blood thinning drugs. The procedure is generally safe and harmless, with almost no complications associated and almost anyone can have this procedure. Infection can be a considerate risk, but at a very minimal possibility. Ineffectiveness can be a considerable negative potential for various reasons including irreparable genetic baldness, or the type of hair loss, or any other physical illness.